We’d recommend this mall for when you want to skip all the other swankier options. There are plenty of familiar food hubs, including KFC, Subway, Domino’s, Pizza Hut and Sagar Ratna. There’s also a Big Bazaar (which is usually packed), a theka and a gym. This mall has great options for shopping and grabbing a bite. We’ve listed the restaurants which we frequent the most here. For entertainment, there’s Smaaash, which is a cool gaming centre and a PVR Director’s Cut. You can follow them on Facebook or find more info here. 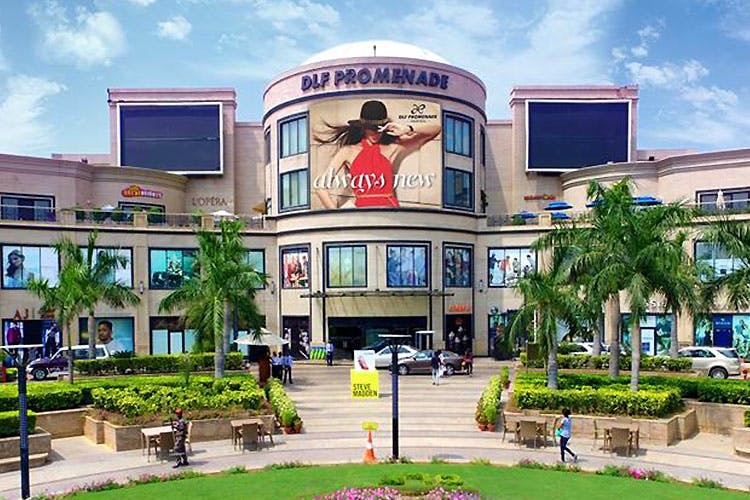 This mall is an all-round cocoon of shopping, entertainment and eating destinations. It also has a PVR and an open-air space called The Hub (with a giant LED screen and Smoke House Deli and Mocha Arthouse on either side), which is the centre of all its fun activities and events. Keep an eye on their Facebook for the latest offers and events or find more info here. This mall is the place to be if you want to buy all things luxe and high-street. From Dior and Armani to Versace and Gucci, they have it all. Their dining options aren’t many, but we’d recommend SET’Z which is a multi-cuisine, fine-dine restaurant with gorgeous outdoor seating. For more info, follow their website or follow them on Facebook here.